Verona Groverman has been involved in a number of assignments on project, programme and policy evaluation, and studies as a team leader and team member. In her evaluation approach she aims at clear outcomes which lead to realistic lines of thinking and acting for the future. She primarily carries out learning-oriented evaluations with due attention to accountability requirements. She favours a participatory approach. Learning and utilisation focus on programme/ policy designers and implementers, where possible and relevant women and men participating in programmes, and stakeholders concerned, among which donors. She mostly uses a mixed method approach with a preference for qualitative methods/ tools carefully developed to fit the nature of an evaluation. During her long-term work in projects and short-term assignments she designed participatory monitoring and evaluation systems for management, staff and target group level. She emphasises a manageable and effective system which should be the result of a joint effort with the users. Verona likes to keep her knowledge about monitoring and evaluation methods and practice updated. Verona Groverman has frequently supported organisations in different sectors to strengthen their organisational performance in terms of gender equality and inclusion. Her work often lies at the interface between social aspects and technical aspects. Her inputs range from facilitating multi-stakeholder workshops, developing a gender policy, strategy or action plan, to longer term supporting gender mainstreaming. Believing that organisational change turns upon people she works as much as possible together with staff in developing a policy, action plan, etc. 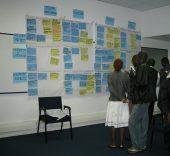 She applies a tailor-made approach where relevant using participatory methods to involve and motivate people concerned. For organisational assessment, she uses specific models, some developed by herself (e.g. the 12 boxes framework’ – see publications). Verona Groverman is a qualified trainer and facilitator with a track record of preparing, delivering and facilitating training and workshops of different nature and of various content. Also here, she often works at the interface of social and technical fields. Her specific capabilities lie in addressing sensitive issues such as gender, HIV and AIDS, and in developing a programme and methods which appeal to the participants. She is experienced in designing and producing training materials and manuals. Capacity building is more than providing knowledge, insight and skills through training. Verona Groverman’s training are designed to impact the work of men and women participating in the learning process and the functioning of the organisation in which they work. She prefers a sandwich model intertwining training and reflection sessions with practical work and coaching to make the effect more sustainable. She is a strong team player with creative involvement of male and female participants and stakeholders. Being a social anthropologist Verona Groverman has been regularly asked to highlight social aspects in more technical sectors. She has a track record in evaluation and advising related to food and nutrition security, water and natural resource management, climate change adaptation, and energy. She is often requested to provide inputs in participatory processes with organisations of male and female farmers, technical and policy departments of government institutions and NGOs, and private sector as key stakeholders. Many of her assignments carefully balance capacity building and advisory inputs. Her background as ecologist provides a welcome addition to her sociological expertise. Verona Groverman has built up extensive knowledge, skills and experience in addressing gender equality issues. She is experienced in gender analysis and assessment, gender planning, assessing and addressing organisational and institutional gender aspects, and monitoring and evaluation from a gender perspective. She is familiar with the practical implementation of gender equality in projects, programmes and organisations. Various organisations in other sectors requested Verona Groverman to carry out an evaluation or study, for example, concerning the situation of labourers in industries, ICT and HIV/AIDS.